It’s about time I started doing more book reviews on Silly Goose. 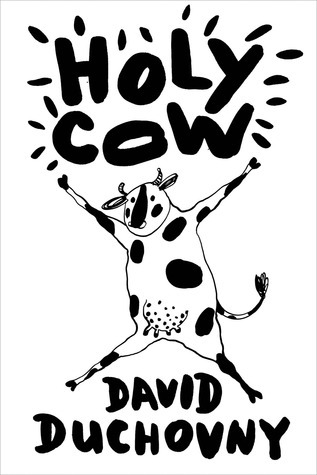 So on that note here is my first book review exclusively for this website, and that book is “Holy Cow” by David Duchovny. Duchovny, of the X-Files and Californication fame, has been around as an actor for quite some time, so I had to at least investigate this first major literary offering; not least because of the title. Having read the outline, and who it was buy, I was intrigued enough to impatiently wait a month before downloading it onto my Kindle. Devastated by this new knowledge, Elsie begins planning to relocate to India, where she hears that cows are revered, and more importantly not eaten. Unable to keep from telling her best friend Mallory everything, including her plan, Mallory is shocked but still, for some reason, makes the decision to stay – presumably because she’s about to have a cow baby and the “nesting” instinct is more powerful than that to run away – but she urges Elsie to go, which results in an emotional departure. However, before long some others nearby catch onto, and want in on, the plan; Jerry the pig, who renames himself Shalom once he realises that pigs are, not quite revered, but are not eaten, in Israel, and Tom the turkey who decides on Turkey because… of the name of the place. So begins their journey, shared but separate, filled with much enlightenment and misadventure. The “narrative voice” – which is Elsie recounting the tale with her editor giving her advice along the way – is a very young and naive one, which would have come across as immature, being peppered with lots of lingo associated with the text-speak generation, if she were not using it to tell a tale with a compelling message, and above all, a tale from the perspective of a cow who is being subject to the cruelty of the human world, and who simply wants to try and make a better life, and not to simply end up on a plate. I was expecting a totally different writing style, but I quickly got into the flow – and the misadventure. I guess it’s glaringly obvious why this book would appeal to me (who doesn’t like talking animals who successfully disguise themselves as human in order to smuggle themselves on a plane..?) – I’m not sure whether or not “Holy Cow” has an intentionally pro-vegan message, but the most clear one is of the “circle of life”, encompassing humans and animals alike. In any case, it basically forces you to empathise with a would-be victim of the shadowy industry which carries out the acts which disturbs Elsie enough to run for her life in the first place. A thought-provoking globetrotting tale.